Last year the Southern Cross Crazies on-line crazy quilting group for Australians and New Zealanders hosted a postcard swap. 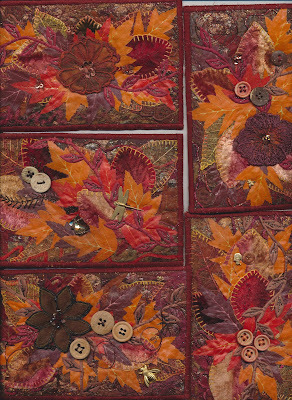 I chose "Autumn" as my subject and made six, one for me to keep and five to send away to my fellow-swappers. The background for the postcards was a sandwich of Autumn/Fall coloured threads, glitter, copper coloured foil paper, copper coloured chopped Angel Fibre and powdered glue which was ironed flat between two pieces of black organdie. At the local Op-Shop (the Salvos), I bought a bunch of artificial autumn leaves for $4 which were really ugly, came home and pulled all the leaves off the plastic stems which netted me a sizeable bag of brown, light orange and reddish orange leaves. I then pulled all the leaves off two stems of brown and beige velvet leaves and added them to the bag along with several autumn coloured leaf skeletons. The skeletal leaves and the velvet leaves were then sewn onto the background using Blanket Stitch and the artifical leaves were heat set with powdered glue and a hot iron. Finally trims were added which included brown leaf trim from Flights of Fancy, cording, copper wire, wooden buttons and tiny gold charms. These are beautiful! I never would have thought of something like that. What did you back your postcards with, and are they stiff? I backed them with a stiff Vylene and then I printed some postcard backs scanned from an old postcard onto fabric and sandwiched the Vylene between the embroidered front and the fabric back. Then I machine satin-stitched around the edges. 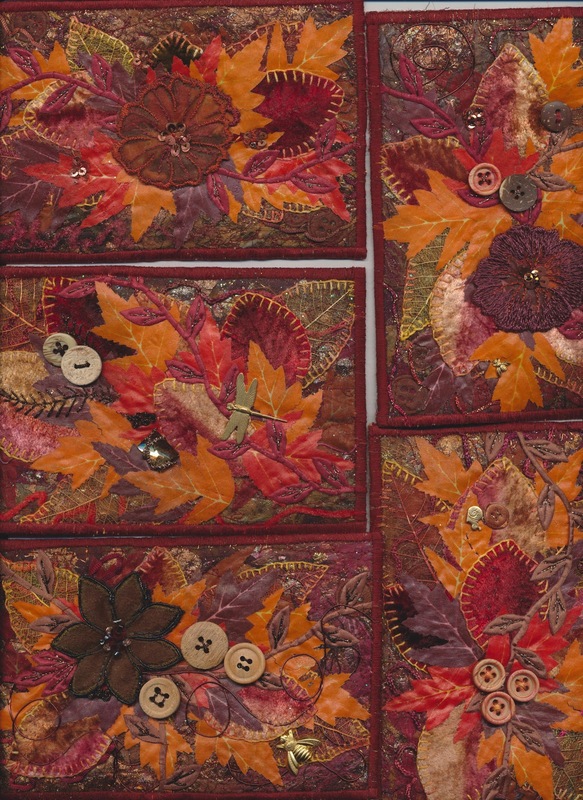 WOW these are awesome Autumn blocks!! !